'Leccy Tech Strange things can often be found off the beaten track at car exhibitions, and the dustier corners of the Pavillon Vert at this year's Geneva Motor Show proved no exception. 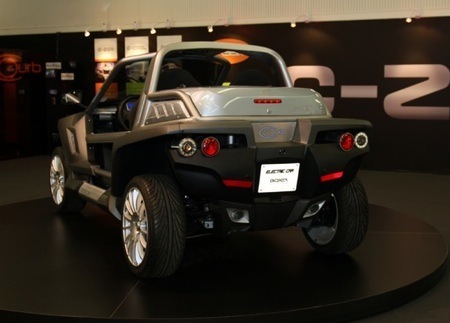 The C-Zen - 'C'est Zéro Emission Nocive', or 'No Harmful Emissions' – from French company Courb is a powered by a 12kW (16bhp) electric motor hooked up to a 96V lithium-ion battery pack weighing 100kg. Drive is sent to the back wheels through an automatic gearbox. Being made of tubular aluminium, the whole thing only weighs 480kg, including the battery pack. So despite the tiny power output, the C-Zen will still apparently make it to a limited top speed of 95kph (59mph) and has a range of 160km (99 miles) at a steady 50kph (31mph). 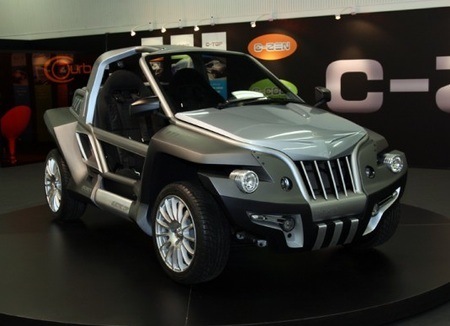 Aimed mainly at French yoof – due to some strange loophole in French law, the C-Zen is classified as a “heavy quadracycle” and as such can be driven on the open road by a 16 year old – the C-Zen will soon be available for €10,500 (£9497/$13,342). Look, ma mere, no licence! 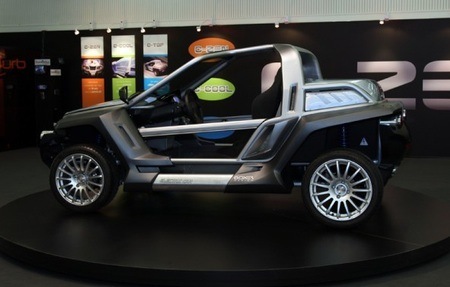 In an effort to keep les enfants safe and well, in addition to being its own roll-cage, the C-Zen comes loaded with safety kit that includes a head-up display, night vision camera, biometric driver recognition, breathalyser starter inhibitor – so no joyriding if you have been on the bordeaux – and it will only move off if you have your seatbelt fastened. Built in GPS allows the parents to keep tabs on what petit Pierre or Élise is up to, while a 'stop-by-SMS' function allow you to turn the thing off remotely if someone nicks it. Does this still work when the thing's going flat out on the freeway, we wonder? For the safety of other drivers, we hope not. The C-Zen also comes with a full set of detachable glass panels to ward off those inclement Parisian winters when you're not zipping about the Côte d’Azur.